SunTrust Bank is one of the leading lending institutions for home mortgages. With over $170 billion in assets, SunTrust has grown from its 1811 origin as the Farmers Bank of Alexandria to become one of the largest financial services organizations in the United States. Consumers looking to refinance their mortgage should consider the many perks the SunTrust Mortgage Company has to offer. If you work with SunTrust, you’ll notice there is a wide variety of fixed and adjustable rate mortgages to consider. Additionally, SunTrust offers up to 100 percent financing and no monthly mortgage insurance payments, which is incredibly appealing in this market (state restrictions on loan-to-value ratio may apply). The fixed SunTrust mortgage rates offers homeowners the comfort of making the same payment every month. A fixed rate mortgage is a great choice for the homeowner who enjoys consistency in his or her mortgage payment schedule. A SunTrust fixed rate mortgage will never change over the life of a loan, which can make budgeting easier for many homeowners. Through SunTrust mortgage, a customer can choose a fixed rate mortgage that can span as little as 10 to as many as 40 years in length. The shorter the period, the higher the monthly cost. But over time, a homeowner with a shorter term will see significant savings since they’ll pay less interest over the long term. Borrowers who are looking to minimize their monthly mortgage payments may be interested in the ARM programs. These loans carry lower mortgage rates than loans that have a fixed rate and payment for their entire life. But, they also carry the risk that they will adjust in the future. ARMs through SunTrust Mortgage are fixed for their first 3, 5, 7, or 10 years. After that, they adjust once a year for the rest of their 30-year life. Because there is a risk of interest rate adjustments, ARMs are usually best for people who will be selling their house, or their loan will be paid off, before their loan terms change. If you’ve built enough equity in your home, consider a HELOC through SunTrust, they are revered for their broad array of home equity loan options. And, as a borrower, if you’ve been with the bank for three years or longer, you won’t have to pay closing costs. SunTrust also offers two unique options to help borrowers better manage their mortgage. Borrowers who want to get out of debt more quickly can opt to make a payment every other week instead of once a month. Making 26 bi-weekly payments instead of 12 monthly mortgage payments lets borrowers pay off their mortgages much more quickly. In fact, a 30-year loan can pay off in around 23 years using this strategy. Imagine being done with paying a mortgage seven years sooner. For some families it could spell the difference between being able to afford a child’s college tuition or having to resort to costly student loans. The ARM Alternative program is a hybrid between a fixed rate and an ARM loan. It lets borrowers take out a fixed rate loan but pay a set fee to get lower payments for the first few years, simulating the lower payments of an ARM. The benefit of the ARM Alternative is that it gives low mortgage payments without the risk of significant interest rate increases in the future. There are other scenarios where one may take out a home mortgage. SunTrust offers mortgages for home renovation and construction projects. In addition, those with a low income may qualify for the Affordable Home Buying Solutions offered by SunTrust. Applying for a SunTrust mortgage can be a time-consuming process, and can require hours of filling out paperwork. However, SunTrust has a number of services available to streamline the process. Their website lets you get started on applying for your loan online. It also helps you find a local SunTrust loan officer that can guide you through the entire refinancing process. While SunTrust mortgage rates are extremely competitive on all of their lending products, they also have unique savings opportunities. Their ARM Alternative aloows fixed rate borrowers benefit from the low rates of an adjustable mortgage, and they also have a special program for jumbo borrowers who need to borrow between $417,001 and $3 million. SunTrust’s Jumbo Solution Mortgage program lets a borrower finance up to $3 million at an 80 percent loan-to-value ratio with a fixed rate but without the high payments and onerous terms of a traditional jumbo mortgage. They do this by combining a “conforming” $417,000 first mortgage with a fixed-rate second mortgage for the rest of the purchase price. 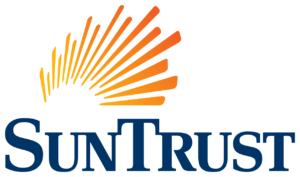 SunTrust is also committed to working with consumers to help them afford an appropriate mortgage. Everyone wins when the right mortgage is selected, so SunTrust participates in programs that make pairings possible for as many borrowers as they can. For example, SunTrust actively participates in the FHA and VA government-sponsored mortgage programs. FHA (Federal Housing Authority) loans are some of the most flexible on the market, and people with a low income level can qualify for FHA loans. That’s in large part because FHA loans require just 3.5 percent down, significantly lower than the typical 20% requirement. The down payment can even come from a gift from a family member, friend or not for profit agency. VA loans do not require a down payment, and this is what makes them an attractive option for consumers that are veterans or active-duty military personnel. The qualifying terms for a VA loan are also very lenient. In addition to the FHA and VA programs, SunTrust also participates in the Doctor Loan Program. This is a very unique program that allows doctors to take out low down payment home loans with low interest rates, as long as they are paying off student loans or attempting to open up a private practice. SunTrust also makes cash-out refinancing available to doctors. Cash-out refinancing is an excellent tool to pay for business startup costs and to pay down student debt. That’s because the homeowner gets to use the equity they’ve built up in their home to get liquid cash. This requires the creation of a new mortgage, but if the new mortgage is created when rates are lower than the original loan, it can also mean the homeowner will be paying the same or less in their monthly payment. Make sure to keep your credit score and payment history in good shape to take advantage of this solution. Though there are many perks of working with this financial institution, there are some drawbacks, too. If customer service, and the ability to work with someone face-to-face is a priority for you, SunTrust might fall short. Also, if you’re not located in their service region – the Southeast – you won’t be able to work with this institution. This bank has a limited number of physical branch locations. They are currently only in 11 states and Washington, D.C. Some banks, like PNC Mortgage, do a great job of considering alternate forms of credit when borrowers go through the qualification process. Currently, SunTrust does not consider alternative credit qualifiers like rent or utility payments, in their underwriting process. If your credit score is below 620, you might be hard-pressed to secure a loan through SunTrust. As always, it’s important to consider a variety of lenders before making a decision for refinancing. Weigh the terms of your current mortgage against new offers from lenders. It’s important to also consider the closing costs or ancillary fees that are associated with refinancing. It’s always wise to use a mortgage calculator to see how much a SunTrust refinance will save – or cost – you over the life of your loan. Whether one wants to refinance or needs help purchasing a new home, SunTrust has an excellent program available. Between their competitive rates and creative loan terms, SunTrust makes it easy for people in their coverage area to reap the benefits of home ownership. If SunTrust is for you, get started by visiting suntrust.com/home-mortgages.